Seek and you may find! The outdoor pool at the rear of the hotel. 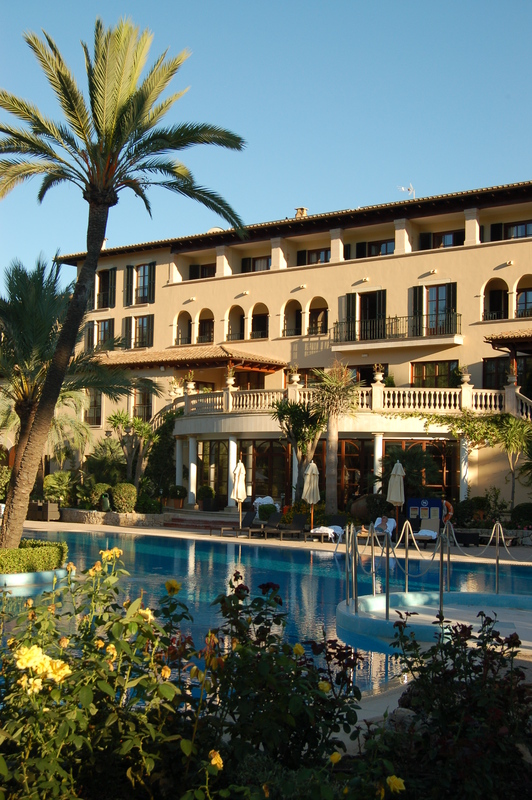 Strictly speaking, this hotel is called the Sheraton Mallorca Arabella Golf Hotel – but taxi drivers will know where you mean if you ask for “the Sheraton”. If you get a newbie, it’s on the Son Vida estate, just outside Palma. The longer-than-convenient hotel name reminds me of my former days of doing PR for Holiday Inn Worldwide (EMEA). When they acquired the famous Midland Hotel in Manchester (where Rolls and Royce met in 1904 and formed their legendary car company), head office dictated that the landmark property should, in future, always be referred to in media communications as Holiday Inn Crowne Plaza Midland-Manchester. Perhaps not surprisingly, local editors resisted all attempts to persuade them to use the new name and continued to call it The Midland. I’ve always loved seeing and staying in hotels and look forward to the times when we throw a few essentials into a suitcase and head off for a night away in another part of Mallorca. We’d not stayed at the Sheraton before, so why not? It was closed for nine months last year for a refurbishment that cost 13 million euros. I was curious. We stayed for one night in a double room (with private balcony and views of the Son Vida hills and lush greens of the golf courses). Dallmayr coffee capsule machine in the room – no kettle and nasty instant coffee sachets here! Low-level small light at the side of the bed – just enough to let you see your way to the bathroom in the middle of the night, but not enough to disturb your sleep. Another good point to note: there is carpet in the corridors, so no clattering heels on marble floors to rouse you from your Sweet Sleeper slumbers. The hotel has a new Shine Spa – apparently Europe’s first in a Sheraton Resort. We didn’t use it, but the indoor pool and treatment rooms look good. Outdoors there’s a huge pool (only for looking at during chillier months), two tennis courts and a fitness pavilion. We ate in Es Carbó, which serves cuisine from several Mediterranean countries. As tapas fans we’d hoped to eat in Bodega del Green but it was closed that evening. If you decide to stay here and fancy tapas, best check that it’ll be open. In fine weather, you can eat alfresco in both restaurants. Just part of the breakfast buffet. 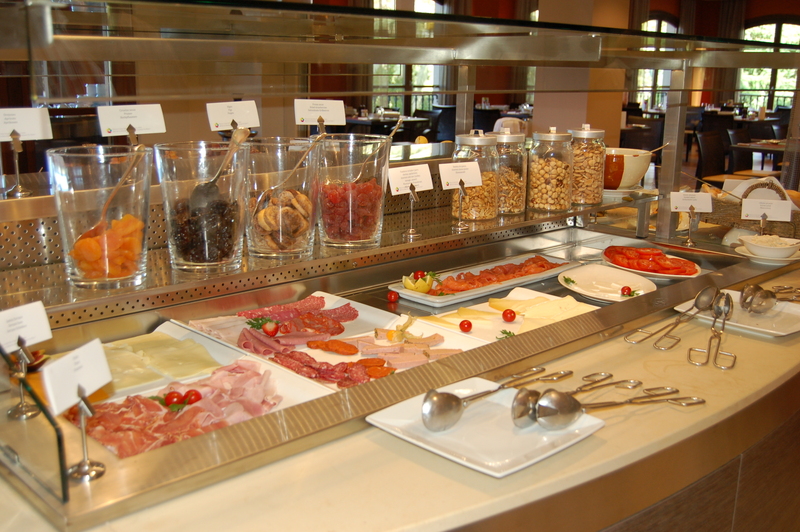 Breakfast is buffet style and with masses of choice – including a wickedly indulgent chocolate fountain with fresh fruit kebabs, as well as eggs cooked to order by a very friendly lady who’s been doing the same thing for years yet still seems to love what she does. This is first and foremost a golf hotel and the room prices include green fees for the three courses owned by Arabella on the Son Vida estate. Unfortunately golf isn’t my game (more of a Scrabble girl, myself), but golfers are in their element here, I’ve no doubt. Golf widows (or widowers) can indulge themselves in the spa or head to nearby Palma for some shopping and sightseeing. I was happy just to admire all those greens (it’s been a long while since I’ve had a lawn of my own). There’s a great team of people working here and we were impressed by all the smiles and greetings we had during our short stay. I wasn’t surprised to learn this week that they’ve been nominated for the chain’s Exceptional Achievement Award 2014. Check out this video and you’ll see something of the hotel and staff. Little things count . . . The investment of thirteen million euros has brought a lot of improvements – in facilities and interior design – and resulted in a lovely hotel where we’d happily stay again. But one of the things that impressed me most about the Sheraton Mallorca Arabella Golf Hotel had nothing to do with corporate standards or mega-money investment. 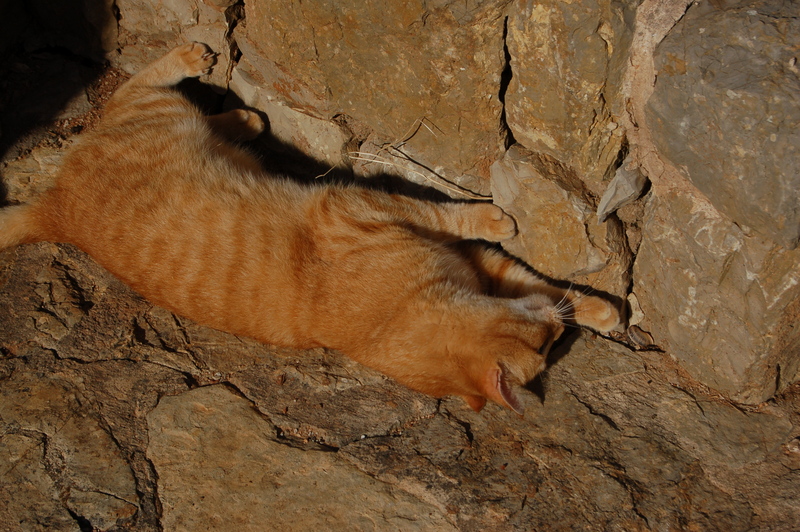 The one-eyed cat, rolling in the sunshine at the foot of a stone wall. Walking around the gardens we came across a friendly one-eyed ginger cat, that seemed very much at home. Mentioning it later to a member of staff, we learnt that it had been ‘rescued’ as a feral kitten by the hotel and now lives happily in the grounds. Everyone there seems to care about the creature, which had a rough start to life but now enjoys the attentions of hotel staff and guests alike. And while the hotel was closed for refurbishment, the builders took over the task of making sure the cat was fed. Now that’s my kind of hotel!